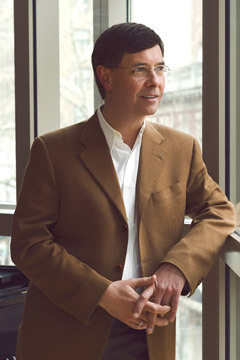 Roberto Díaz is president and CEO of the Curtis Institute of Music. Mr. Díaz is a teacher of viola at Curtis and a former principal violist of the Philadelphia Orchestra. As a soloist, Mr. Díaz collaborates with leading conductors of our time on stages throughout North and South America, Europe, and Asia. Mr. Díaz's recordings on the Naxos label with pianist Robert Koenig include the complete works for viola and piano by Henri Vieuxtemps and a Grammy-nominated disc of viola transcriptions by William Primrose. Mr. Díaz received an honorary doctorate from Bowdoin College and was awarded an honorary membership by the National Board of the American Viola Society. In 2013 he became a member of the prestigious American Philosophical Society founded by Benjamin Franklin. Since founding Curtis on Tour in 2007, Mr. Díaz has taken this successful initiative to North and South America, Europe and Asia, performing chamber music side-by-side with Curtis students and other faculty and alumni of the school. Also under Mr. Díaz’s leadership, Curtis has developed lasting collaborations with other music and arts institutions in Philadelphia and throughout the world and established a dynamic social entrepreneurship curriculum, supported by a prestigious Advancement Grant from The Pew Center for Arts & Heritage. Designed to develop the entrepreneurial and advocacy skills of young musicians, this curriculum includes the project-based Community Artist Program (CAP) and post-graduate Community Artist Fellowships.